You surely have come across the post or image about a teacher who drew Microsoft Word on a chalkboard. No? Really? Not yet? Okay let’s catch up. 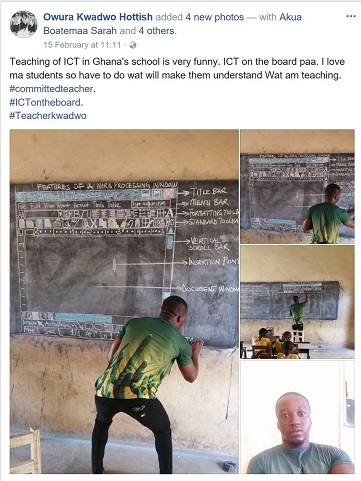 Richard Appiah Akoto an ICT junior high school teacher at Betenase Municipal Assembly, Sekyedomase in Kumasi, Ghana shared a post of his challenge teaching the course in his school. This story wouldn’t be any different in other parts of Ghana. But with his passion and love for his students he decided to do his best. Richard didn’t think his post would amount to him going viral nor getting so much attention he will end up in Singapore. In a conversation with NPR he said he didn’t think it will go that far. The post was drawn to Microsoft’s attention and they decided to do something about it. Microsoft promised to equip Richard Akoto also known as Owura Kwadwo, with a device through its local partners. Also giving him access to the Microsoft Certified Educator(MCE) program and other development resources. It is through this MCE program that Microsoft invited Richard to join them at its 2018 Education Exchange conference taking place in Singapore. Microsoft’s Education packages and solutions are about empowering every student and educator to achieve more. Doing this with the best of Microsoft tips and resources for education. Last year Microsoft launched new education packages that schools and educators can use to transform learning. 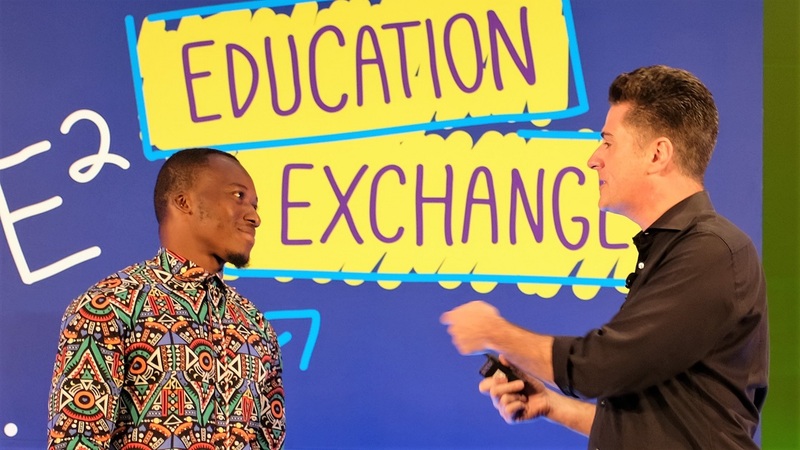 At E2 Microsoft Worldwide Education Vice President, Anthony Salcito, welcomed Richard on Stage to share his story. E2 is a Microsoft event that brings together innovative educators from around the world to collaborate, create and share experiences on how to integrate technology, advance learning and transform education. “I never grew up with a computer, I said to myself if i wasn’t able to get the chance to use a computer the students should get a chance. We were launching Microsoft Word and per the curricular we have to take them through the steps. I wanted to teach them how to launch Microsoft Word but I had no computer to show them. I had to do my best. “I have been doing this every time the lesson I’m teaching demands it. I’ve drawn monitors, system units, keyboards, a mouse, a formatting toolbar, a drawing toolbar, and so on. The students were okay with that. They are used to me doing everything on the board for them. When I did this, it was nothing new or strange for them.